Wheat-canola rotation is not the best. Yield response of Manitoba crops sown on large (>120 acre) fields of various crop (stubble) in rotation 2010-2016. Courtesy of MASC. Knowing the cost of production is the starting point of profitability, but estimating profitability over the longer term can be difficult. Add in different crop rotations and the analysis gets mind-boggling. But data from Manitoba Agricultural Services Corporation (MASC) holds a lot of answers for farmers looking for the most profitable crop rotations over the longer term – and it isn’t wheat-canola. “Each year is different, but you need to look at the relationship between yield, commodity price and costs for your situation and risk,” says Roy Arnott, farm management specialist with Manitoba Agriculture in Killarney, Man. Each year, Manitoba Agriculture produces its resource Guidelines for Estimating Crop Production Costs in Manitoba. Crop production budgets are based on estimated costs, including operating, labour, investment and depreciation. Yields and prices are also based on the most current estimates. 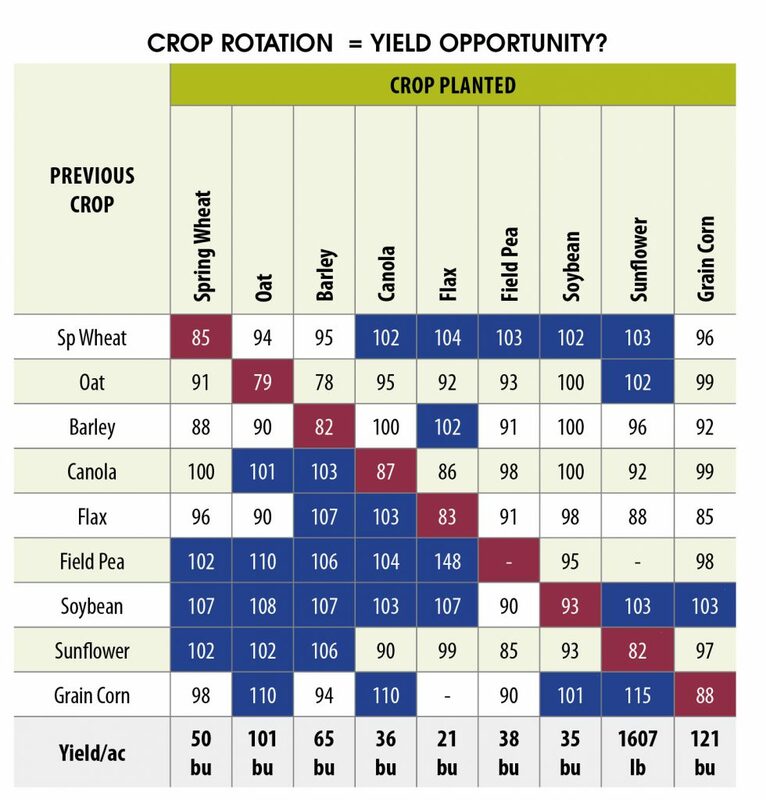 Using MASC yield data, Manitoba Agriculture conducts an economic analysis of various crop rotations. The 2019 Guidelines for Estimating Crop Production Costs in Manitoba utilizes yield data from MASC Harvest Production Reports from 2010 to 2015. It includes three example rotations over six years and if downloaded as an Excel spreadsheet, a fourth rotation that can be customized to suit growers’ own rotations. Crop rotation, or lack of, has a very large impact on yield. Anastasia Kubinec, manager of Crop Industry Development with Manitoba Agriculture, says that data from MASC consistently shows lower yield when a crop is planted back on its own stubble. The data also shows where higher-than-average yields can be achieved when a crop is planted on different stubbles. Manitoba Agriculture analyzed crop yields from 2010 through 2016, which compared yields for 12 different crops. For example, canola on canola stubble only yielded 87 per cent of average canola yield compared to 110 per cent if grown on grain corn stubble. Kubinec says other factors can also impact yield and profitability. Time of seeding has a large impact on yield. Manitoba Agriculture looked at yield and profitability of six crops. That data helps to guide which crops to plant first or last. “After the third week of May, profitability starts to drop off. Think in terms of dollars per acre when planning out when to seed your various crops. Consider which seeding date will have the least dollar loss for various crops,” Kubinec says. Manitoba Agriculture has a suite of decision tools and calculators to help growers plan their rotations and profitability. “The calculators help growers compare profit probability and agronomic risks. It’s vital to know the risks and rewards of the different crops, and to use good agronomics to improve your chances of increased profitability,” Arnott says.